"Ever watch a server vomit?" What happens when a run initiated by Glut Cipher is successful and there are fewer than 5 cards in Archives? The Runner does not access any cards. The Corp does not add any cards from Archives to HQ nor trash any cards from HQ. Which player trashes the random cards from HQ? Does this trashing trigger effects like Hostile Infrastructure? The Corp is forced to trash the cards. 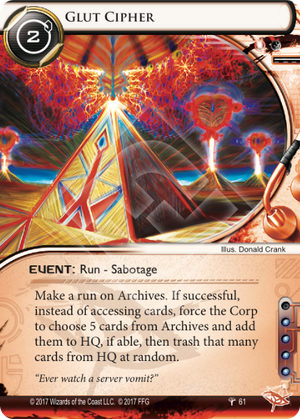 Effects that care about the Runner trashing cards will not meet their trigger conditions from Glut Cipher's effect.